In this June 4, 1942 photo provided by the U.S. Navy, Torpedo Squadron Six aircraft are prepared for launching on USS Enterprise during the Battle of Midway in the Pacific Ocean. 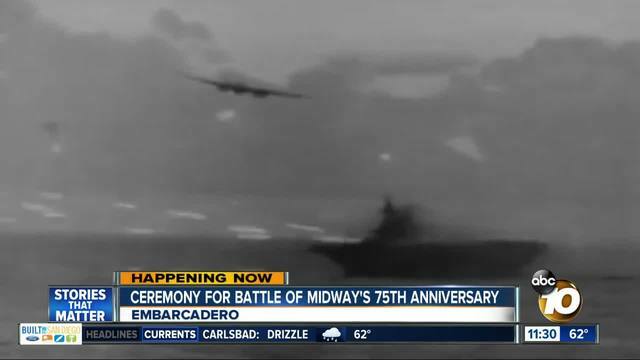 SAN DIEGO (KGTV) - The 75th anniversary of the Battle of Midway was marked Monday with a ceremony on the USS Midway's flight deck. Just six months after the attack on Pearl Harbor, the Battle of Midway began June 4 and ended June 7. The battle on Midway Island is considered one that turned the tide for the Allies in the Pacific. Monday's event was the first time the Navy has opened its annual ceremony to the public. More than 750 people, including those who survived the battle, attended the ceremony.